Though "low-temperature pyroclastic flow" is frequently observed with phreatic eruptions, there are few descriptions of its internal environment. 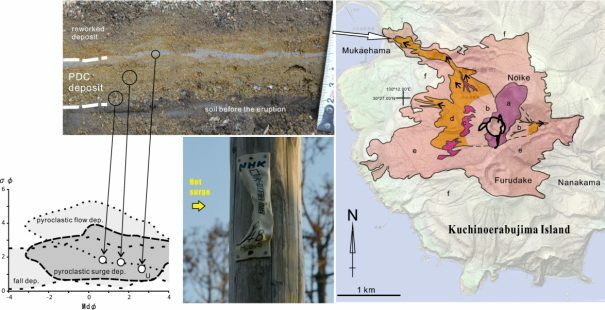 The low-temperature pyroclastic flow of the 2015 eruption of Kuchinoerabujima volcano, southwestern Japan, provides geophysical data, video image, and geological descriptions of the deposits. The video image indicates that the velocity of flow exceeded 42 m/s. The dieback of the vegetation and deformation of some plastic materials in the flow, with absence of carbonization of woods, suggest that the temperature in the flow was between 100 and 270 degrees Celsius. Though the estimated temperature is lower than the magmatic pyroclastic flows, the physical environment inside the flow is still fatal to human. This article was a contribution to the special issue of "Towards forecasting phreatic eruptions: Examples from Hakone volcano and some global equivalents."